Starting in 2010, the Belgian Beer Weekend in Tokyo was started. It was a big success the first year and has grown significantly since then. It started in just Tokyo and expanded into Osaka in 2011. 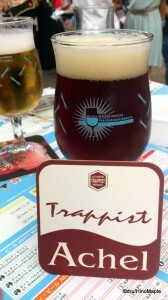 This year the Belgian Beer Weekend expanded into Nagoya as well. It is a typical international festival that Japanese people love to visit. It combines outdoor areas, an international flavour, and copious amounts of beer. Unlike most international festivals, the Belgian Beer Weekend focuses a lot on beer which makes things more popular than the other international festivals. Like most festivals in Tokyo, you need to exercise a lot of patience as there are bound to be lots of people and trying to get in and around an area that tends to always be too small for the number of people attending the event is taxing. The area is lined with various shops that will make getting a beer a challenge in patience as you have to wait for everyone in line to get their beer before you do. While the crowds can be crazy, picking the best times to go and finding a bunch of good friends is the best way to enjoy this new festival in Tokyo but not necessary as you can always make new friends. The Belgian Beer Weekend is a huge event wherever it goes and it caters to what Japanese people love the most, beer. 2012 marks the 14th year of the original festival held in Brussels, Belgium. The original festival is put on by the Belgian Brewers, an association of Belgian brewers that encompasses all brewers in Belgium in order to maintain the quality and brand of Belgian beers. The association’s official goal “is directed in particular at economic, social, national and international regulations, fiscal and legal affairs, agricultural problems and activities for the promotion of beer” in Belgium. In 2010, the Belgian Beer Weekend expanded outside of Belgium for the first time. The Tokyo event was attended by about 15,000 people who helped make the weekend a huge success. In 2011, the second year, 21,000 people went to the Tokyo weekend and 13,000 went to the Osaka weekend. According to the Belgian Beer Weekend website, they are expecting over 50,000 people to attend this year, but they don’t explicitly say whether it is for all cities combined or for just Tokyo. For such a short festival, I would be a little surprised to see that many people at the Tokyo festival, but who knows as the Tokyo festival encompasses 5 days of revelry. 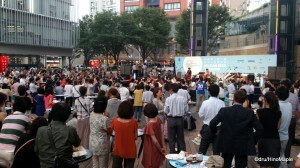 The Belgian Beer Weekend has always been held in the Roppongi Hills Arena. It is a large open area next to the TV Asahi studios building. The arena itself is a busy area that holds various events throughout the year. Stages can be built into the arena where you can see people performing various concerts. Some concerts require tickets but generally most of them are local events with choirs or other community based groups singing on stage. One of the biggest events held in the Arena is the Azabu Juban Matsuri where they have a huge Bon-odori dance held within the entire arena. It can be a huge spectacle to see hundreds of people doing a Bon-odori with a taiko and singer in the middle. For the past two years, and including this year, the Belgian Beer Weekend occupied the entire arena and overflowing into a neighbouring garden with every available space being taken up by joyful attendees. Most of the arena is occupied by standing tables and most people will have to get by standing at these tables. It is essentially a large outdoor standing bar. There is a special VIP area that does have tables with seats but for most people going to the Belgian Beer Weekend, the standing area is the only area they will access. At the height of each evening, the arena becomes so full of people that people just sit down on the few steps that are around the arena as well as a small garden located next to the official Belgian Beer Weekend area. In 2012, the Belgian Beer Weekend consisted of dozens of different types of beer. There are 10 categories of beer and roughly 77 different beers that you can try during the weekend If you can try 5 beers, one from each category, you get to enter yourself into a draw for a prize. There are the traditional Trappist and Abbey Beers as well as White Beers and Pilsners. It is nearly impossible for me to describe all of them and even harder to try all of them, but thankfully my friends were kind enough to let me get a quick sip of their beers as well. I had a chance to try the Lambic Beer which ended up being very acidic, and disgusting. I felt sorry for the new friend I made who did choose to try it. Needless to say, none of us decided to try any of the other Lambic Beers available. One of the more popular beers of the festival was the Fruit Beers. These are, as the name implies, a set of fruit infused beer. These fruit beers consisted of the second largest group of beers available and often came in various hues of red. They were obviously fruity and came from a typical rosé like taste to a fizzy fruit punch. Although I hate to stereotype, unless it is a joke, most of the girls enjoyed these fruit beers rather than the guys. 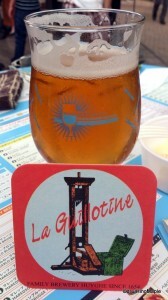 Personally, I enjoyed drinking the Golden Ale, La Guillotine as well as the Trappist Beer, the Achel Brown. When at the Belgian Beer Weekend, it is best to try various types of beers, but if you do find one you like, just keep enjoying and don’t let anyone else tell you otherwise. The Belgian Beer Weekend is marvel in marketing. It combines the ability to promote tourism to Belgium, selling various brands of beer, and making a lot of money in the process. It is amazing that other countries don’t do this more often. The only other country to do such a thing is Germany, but Oktoberfest is so overly done out now that you can find an Oktoberfest festival nearly every month in Japan. The Belgian Beer Weekend is a bit on the expensive side. 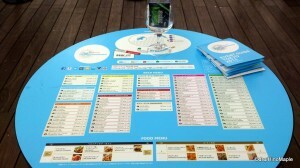 The system is set up so that you have to pay 3100 yen to get in. 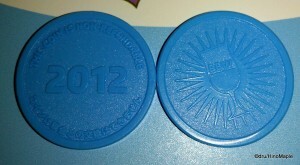 This includes 10 tokens, a glass, and an information guide. When I first got in, it was nice to have a lot of space and a relaxed atmosphere. I could decide what I wanted to drink and not worry about anything. If I went later, it wouldn’t be the same. Extra tokens are 1000 yen for 4 tokens and it is pretty expensive considering you only get a single glass, rather than a full bottle. They make sure never get a full bottle, but when you have no plans to visit Belgium in the future, you have to make do with what you have. During the festival itself, they had a long opening ceremony, a couple of music acts, but mostly just people having fun. I had several friends just decide to go to the festival after work and it was easy to meet up with people. There were impromptu conga lines during the festival and I even met a nice Belgian couple who were visiting from Belgium. It is amazing what a few glasses of beer will do to your social skills. The best part of the festival is just enjoying the beers and making many friends. This entry was posted in Festivals, Tokyo Food and tagged 2012, Abbey Beer, Achel, Achel Brown, Azabu-juban, beer festival, Belgian, Belgian Beer, Belgian Beer Weekend, Belgian Beer Weekend Japan, Belgian Beer Weekend Tokyo, Belgium, festival, Fruit Beer, Golden Ale, japan, La Guillotine, Lambic Beer, matsuri, Nagoya, osaka, roppongi, Roppongi Hills, Roppongi Hills Arena, tokyo, Trappist Beer, TV Asahi by Dru. Bookmark the permalink. They are having their autumn beer festival at Keyaki Hiroba near Saitama Shintoshin station, September14-17. You can taste Japanese craft beer from many regions, though I didn’t see Dogo beer(>_<). Thanks for the info. I’ll look into it but I don’t think I can go. 🙁 I did find a place that had Dogo Beer for sale in Shinbashi. Last time I went they were sold out though. The Kagawa and Ehime Satellite shop, if you know it. PS: I’ve heard there’s a chocolate beer, but I can’t remember which country produces it. I wouldn’t be surprised at all if it were Japan! There must be others but I don’t know them. I would be a little surprised if Japan has it as Japan is a bit strict on independent brewers. Might be better now. Oh, a Belgian Chocolate Weekend would be cool. Then again, they do have Valentine’s Day/Season and they bring in all sorts of foreign chocolatiers. Google is my best friend. 😀 I went Googling, and … Japanese breweries release chocolate beers for (you guessed it!) Valentine’s Day. There’s one called Sapporo x Royce Chocolat Brewery Bitter and another one called Doppo White Chocolate Beer. I’d love to try both. Hmm. They might even be in that massive beer shop in Solamachi, or do you think they’re too seasonal to be included in a general collection? I used to drag chocolates and beer for my coworkers on every visit, but gave up when I found you can get these very easily in Tokyo. There have always been Belgian Beer bars, and in departement stores like Mitsukoshi there usually is a good assortement in the drinks section. Check out http://www.belgianbeercafe.com/bars/list, the internal design is really original as if they shipped over a complete cafe. You can also get original belgian food there. I still take chocolates, even though there are Godiva outlets in places like Ueno station, etc. Except when I fly through Malaysia: not only is the temperature too high too keep chocolates even for a short while, also my family-in-law will confiscate them 🙂 I had to replace them with kua raya last August. Beer used to be part of the meal in Belgium – like miso soup in Japan – and it was very healthy and low on alcohol. The Lambic you mention is part of the beers, like geuze, that only can be produced in certain area’s where the right yeast is in the air. In this case, Brussels. The Cherry bears are usually sweater and indeed targeted at female audience. I remember long time ago women would put syrup in their dark beers to make it more sweeter. The bands that are send over for the Belgian Beer Festivals, are usually the latest revelations in Belgium, and the whole event is of course heavily sponsored and used to promote Belgian industry as a whole. I’ve recommeded the event to friends, I’m sure they will attend next year. To be honest, I didn’t research the Lambic beers enough. Now that I did, it is interesting. While I still don’t like it, I can see how important it is to Belgium. I can see it working well within food though. I will say this again, it was well marketed and did make me want to go to Belgium. Wish to go there again someday in the future.